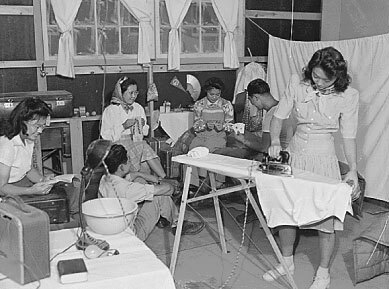 Shortly after the bombing of Pearl Harbor and war was declared with Japan, the U.S. government swiftly enacted a series of measures to restrict the movement of Japanese Americans in the United States and Hawaii. Suspecting that there might be potential spies within the Japanese American population, prominent community leaders, Buddhist priests, and Japanese language teachers were arrested. Anti-Japanese sentiment started growing months before Pearl Harbor. 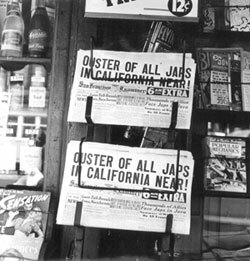 On the left are headlines calling for the ouster of all persons of Japanese ancestry from California. On the right are the postings requiring people of Japanese ancestry to prepare to "relocate' from the western coastal regions. National Archives. All nine members of the Mochida Family of Hayward, California, waiting at the municipal park with other families for the bus that would take them to the Assembly Center. National Archives. On February 19, 1942, President Franklin D. Roosevelt issued Executive Order 9066. The order authorized the military to take any measures necessary to assure the security of the United States West Coast. By March 1942, Japanese American communities throughout the West Coast were told theywould have be "relocated" moved inland away from strategic military areas. Some communities received only 24 to 48 hours notice of their impending evacuation. Others had a few weeks. Either way, families and individuals had to find storage or dispose of their property, businesses, farms, and belongings in a very short period of time. Families could each take two suitcases plus bedding. They did not know where they would be going. Piles of luggage and belongings at the municipal park in Hayward. Evacuees boarded buses that would take them to the Assembly Centers. Trucks came along later to pick up the luggage, though some had to be left behind. National Archives. Not all Californians wanted the Japanese Americans moved out of the state. Here, a friend comes to say goodbye and wish the family well, Hayward, California. National Archives. 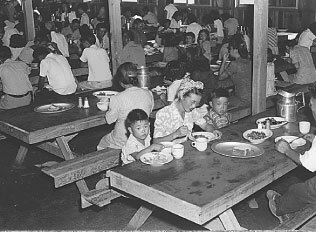 Most of the people of Japanese ancestry were evacuated first to Assembly Centers. On the left is Tanforan, which was a racetrack. The Japanese were housed in the horse stalls. On the right is the Salinas Assembly Center, which was hastily built on the Salinas Fairgrounds near the rodeo arena. Note the piles of baggage in the foreground. National Archives. Assembly Centers: The first stop for most people were the Assembly Centers. These were temporary facilities located at country fairgrounds and farm stockyards where the housing often consisted of small rooms that were once inhabited by horses (see Table 1). Families shared tight living quarters with little knowledge of where they would be going next. There was little to do, in some centers, schools were started, but books and supplies were not available. Within a few months, Japanese Americans boarded trains and buses, and shipped to more "permanent" facilities, or Relocation Centers. * Manzanar was transferred to the War Relocation Authority for use as a relocation camp. Signpost on the way to Poston Relocation Center, Arizona. National Archives. Relocation Centers (see Table 2): The relocation centers, more commonly referred to as internment camps, were located in the states of Arkansas, Arizona, California, Colorado, Idaho, Utah, and, Wyoming. They were built with military style barrack housing, central dining, washroom, and shower house facilities. The barracks measured 20 by 100 feet long and were subdivided into four to six rooms per barrack. (approximately 20 by 16 or 20 by 25 feet) housed a single family. The rooms were heated by a single pot-bellied stove and had one electric light bulb. There were no room dividers and the beds were army issue cots. Poston Arizona, was built on the Colorado River Indian Reservation. National Archives. Gila River, Arizona, was built on the Pima Indian Reservation. National Archives. Manzanar, California, above. Tule Lake on the right, was the other camp built in the interior region of California. National Archives. Minidoka, Idaho. Several of the camps, like Heart Mountain and Minidoka, as well as Topaz Utah, experienced heavy winter snows. Most Japanese Americans had never lived in snowy areas and evacuated without heavy winter clothing. National Archives. Topaz, located in the desert region of Utah, near the town of Delta. National Archives. On the left is Jerome and the right is Rohwer, both built in Arkansas. Though the areas were forrested, both camps were largely on virgin swamp land that had to be cleared before any building took place. National Archives. On the right is Granada (Amache), Colorado. National Archives. Each room (approximately 20 by 16 or 20 by 25 feet) housed a single family. The rooms were heated by a single pot-bellied stove and had one electric light bulb. There were no room dividers and the beds were army issue cots. Camp living was not comfortable, particularly when evacuees had to endure harsh weather conditions, extreme heat, and freezing temperatures. Many were not prepared for these living conditions. Communities had to adjust and make do with the resources they had—cooks, carpenters, electricians, teachers, plumbers, and medical personnel, all were used to make the camps inhabitable and to support the population living there. As difficult as these times were for the residents, they had to come together as a community to overcome the hardships of their confinement. This is a typcial interior of a barrack. Families were crowded together, often in one room. Curtains and blankets were hung up for privacy. This family actually has a bit more in the way of belongings than most. National Archives. Former camp residents talk about the lack of privacy for families and individuals. Since barrack rooms housed entire extended families, married couples and families with children did not have their separate rooms. Eating was done in a communal "mess hall" and bathroom stalls initially had no doors on them for privacy. Although food was adequate, it may not have been palatable for everyone. Because of the wartime, there were shortages with sugar, meat, milk, and other essentials. All of these things contributed to increased tension and disagreement in families because of the strained living conditions. While every attempt was made to make life "normal" inside the barbed wire fences of the camps, it was still difficult for many residents to carry on with their lives as they had before the war. There were many Nisei (second generation) who had some college education and training. They became teachers and clerical workers. But schools were woefully inadequate, with little in the way of books and supplies. Doctors, nurses, and dentists were also found among the population and they formed the basic, yet again undersupplied medical unit for the camps. Camp administrators were non-Japanese, brought in as government workers to oversee the mass bureaucracy of the small town camps. The US government spent on average, about 45 cents per day, per person for food. This was three meals per day for each man, woman, and child. Needless to say, meals were bland and not exremely nutritious even though the Japanese American cooks tried their best with the available supplies. At left is an example of a lunch serving at Manzanar. National Archives. Soon after their arrival in the camps, the Japanese obtained permission to farm food crops and livestock. The government supplied the tractors, seed and irrigation equipment as well as the livestock This is a cabbage patch at Tule Lake, California. National Archives. 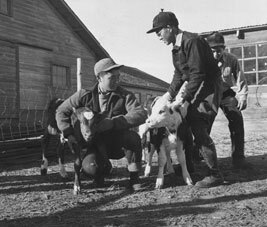 The experienced Issei and Nisei farmers knew how to raise livestock, which eventually also included poultry and beef cattle. Some had operated much larger farms back home. This is the hog farm at Amache. National Archives. Kids in the 4H Clubs helped with the livestock. Amache, Colorado. National. National Archives. Within a short time after the camps opened, many began to try and find ways to leave. While they could not return to their West Coast homes, they could move elsewhere in the United States, provided they could find employment and tolerate the anti-Japanese attitudes. 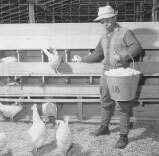 The restrictions of the camp became too many for some, and since there was a shortage of farm labor in Idaho and Montana, many left the camps to work in agriculture. They left for places such as Seabrook Farms, New Jersey or Chicago, or anywhere else in the Midwest and East they could find jobs. Some Nisei found support through the college Nisei relocation program that found colleges and universities that would take them to continue their education. Rohwer, Arkansas, also had extensive farming operations. However, the land, which had never been developed, was heavily forrested. Evacuees had to cut and clear the land before farming could begin. They operated a small sawmill and the surplus wood went into building the camp and making furniture for the school. National Archives. Though there was a small motorpool of vehicles at Rohwer, most of the farm hauling was done with mules. Here, boys are delivering wood to the barracks. National Archives. Every able-bodied adult was offered work in camp, either in some aspect of camp administration, farming, the coop store and beauty/barber shops, food and laundry services, fire prevention, etc. They earned between $12 and $16 on average per month. The salaries were important because internees had to purchase extras such toiletries, clothing, postage, etc. Here, two women are assisting with the potato harvest at Tule Lake. National Archives. Some camps like Tule Lake, had good soil. Other locations like Topaz were largely desert. At the camps better suited to agriculture, often, the experienced Japanese American farmers, were able to produce far more food crops than the camps could use. Every fall, some camps would hold Harvest Festivals with displays made by the schoolchildren. National Archives. Beet field workers in Idaho. National Archives. Machinist, office employees, and electroplating worker. National Archives. 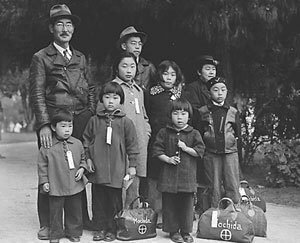 In the case of Mitsuye Endo, the U.S. Supreme Court ruled that the government could not detain admittedly loyal individuals in camps. This opened the doors for many more to leave camp and eventually return to their West Coast homes. By 1945, most of the camps had closed. In 1946, Tule Lake in California was the last camp closed. For the most part, kids did not have a bad life in camp. Most of the school-aged ones were too young to understand about the loss of civil rights and civil liberties. Parents tried their best to make the children's lives as normal as possible. The children went to school, played with friends and had many organized activities like this baseball game at Manzanar (left) ahd the Topaz High School football team warming up for the upcoming game of visiting Fillmore High. National Archives. Kids, especially those from farm families, now had freedom from chores. They had more time to play and be with their friends. Baseball and team sports played an integral part in children's lives. There wasn't a whole lot to do besides attending school so recreational activities and afterschool arts and culture classes had to be organized, both for children and adults. The high school football teams often played other rural town teams and became real sports events for parents and internees. These are some of the orphan children at Manzanar. It didn't matter if you were an orphan, if you had 1/8th Japanese ancestry, you had to go to camp. The Children's Village barracks housed 65 children from three different institutions. National Archives. Almost all the camps had both Boy and Girl Scout troops. Here, the Rohwer and Jerome Boy Scouts go on a chaperoned camping trip in 1944. Bancroft Library. Denenberg, Barry (1999) Journal Of Ben Uchida : Citizen #13559, Scholastic Books, ISBN: 0590485318. This is a novel, written as the journal of twelve year old Ben Uchida. His family's experiences at Mirror Lake are told through his eyes. Reading level, 4th grade and up. Houston, Jeanne, (1983) Farewell to Manzanar, Bantam, ISBN: 0553262165, reading level 5th through 12th grade. Houston's book has become a standard part of school reading west of the Rocky Mountains. It is the story of her family's incarceration at Manzanar. It was adapted into a film version (see below.) Many teaching guides are available through Amazon.com and the Asian American Curriculum Project (AACP) see below in website section. Matsuoka, Jack (2003) Poston: Camp II, Block 211: Daily Life in an Internment Camp, Asian American Curriculum Project, ISBN-10: 0934609098. Jack Matsuoka was about 16 years old at the time of the relocation. He drew cartoons and wrote captions about his experience as a young teen in camp. This book is a collection of the drawings he saved with some commentary he has written to accompany the illustrations. Means, Florence Cranell (1993) The Moved Outers, Walker and Company, ISBN: 0802773869. This Newberry Honor Book, is a novel about the experiences of high school student Sumiko Ohara (Sue) and her family in internment camp. Reading level is 4th through 6th grades but topics may make the book more appropriate for middle school students. Mochizuki, Ken, (1995 Reprint edition), Baseball Saved Us, Lee and Low Books, ISBN: 1880000199. Reading level 2nd to 4th grade. Shorty's father builds a baseball field in camp. Baseball helps make life in camp more normal for the children. Oppenheim, Joanne, (2006), Dear Miss Breed, Scholastic Nonfiction, ISBN-10: 0439569923. This book is a collection of letters from students, from the sixth to tenth grades. Miss Breed was librarian at the San Diego Public Library who came to know many of the Japanese American kids who frequented her branch. In 1942, she began sending letters and care packages of books, candy, and other treats to the kids when they were forced to evacuate with their families. She also wrote articles for Library Journal and The Horn Book that articulated their plight. In return, the recipients expressed their gratitude in letters. While their lives were marked by deprivation and uncertainty, their letters reveal an unquenchable optimism. Shigekawa, Marlene, Blue Jay in the Desert (2000) AACP Inc. Publishing, ISBN:1879965046. This is the story of a Japanese American boy and his family who are interned during World War II. Young Junior doesn't quite understand what the internment is all about but through his eyes you are able to see how it has affected the adults around him. Stanley, Jerry, I am an American: A True Story of Japanese Internment (1996) (ALA Notable Children's Book, Horn Book Fanfare Honor Book) Crown Books for Young Readers, ISBN: 0517885514. The author presents a highly personal portrait of Shi Nomura, one of the nearly 120,000 Americans of Japanese ancestry whom the federal government ordered evacuated from their West Coast homes to relocation camps as a result of war-provoked hysteria and hostility. Uchida, Yoshiko (reissued 1988) Journey to Topaz, Scott Foresman, publisher ISBN: 0916870855, Reading level 3rd to 4th grade. This book was one of the first written for children about the forced relocation.It tells the story of Uchida's family from the perspective of their ten year old daughter. There is an accompanying teacher's guide, Using Journey to Topaz in the Classroom, by Caroline Nakajima, 1994, Teacher Created Materials, ISBN: 1557344302. Available from Amazon.com. Uchida, Yoshiko, 1996, The Bracelet, Puffin Publishing, ISBN: 069811390X, Reading level 3rd to 5th grade. The story of Emi and her family, evacuated from Berkeley, CA in 1942. Emi loses her most prized keepsake, a bracelet, given to her by her best friend. Eventually she realizes that she doesn't need a token to remember those who love her. Welch, A. Catherine, Children of the Relocation Camps (Picture the American Past) (2000) Carolrhoda Books Publisher, ISBN: 1575053500. The brief text explains the hysteria, distrust, and hatred that led to the eventual incarceration of these innocent citizens. The pictures, along with quotations from former detainees, help to describe the experiences families were forced to endure. Gruenewald, Matsuda Mary, Looking Like the Enemy: My Story of Imprisonment in Japanese American Internment Camps (2005) New Sage Press, ISBN: 0939165538. In this memoir, Mary Matsuda Gruenewald writes about what is was like to face an indefinite sentence in crowded, primitive camps; the struggle for survival and dignity; and the strength gained from learning what she was capable of and could do to sustain her family. Inada, Lawson Fusao, editor (2000) Only What We Could Carry: The Japanese American Internment Experience, Heydey Books, ISBN: 1890771309. This is an unusual anthology of poetry, prose, biography, news accounts, formal government declarations, letters, and autobiography along with photographs, sketches, and cartoons that reflect the tragedy of the internment. Komatsu, Kimberley and Komatsu, Kaleigh (2002) In America's Shadow. Thomas George Books ISBN:0970982909. This is a photo book on the internment with personal memories interspersed throughout. Muller, L. Eric, American Inquisition: The Hunt for Japanese American Disloyalty in World War II (H. Eugene and Lillian Youngs Lehman Series) (2007) The University of North Carolina Press ISBN: 0807831735. Muller relates the untold story of exactly how military and civilian bureaucrats judged these tens of thousands of American citizens during wartime. Murray, Alice Yang (2000) What did the Internment of Japanese Americans Mean? Palgrave Macmillan, ISBN: 0312228163. Murray investigates the U.S. government's role in planning and carrying out the removal and internment of thousands of citizens, resident aliens, and foreign nationals, and the ways in which Japanese Americans coped with or resisted their removal and incarceration. Ng, Wendy. (2002) Japanese American Internment During World War II. Greenwood Publishing Group, ISBN: 031331375X. The internment of thousands of Japanese Americans during World War II is one of the most shameful episodes in American history. This reference guide will help students and other interested readers to understand the history of this action and its reinterpretation in recent years. O'Brien, David J. and Stephen S. Fugita (1991) The Japanese American Experience. University of Indiana Press, ISBN: 0253206561. This book is scholarly in nature and provides extensive bibliography of references. Okubo, Mine (1983) Citizen 13660, University of Washington Press, ISBN: 0295959894. Mine Okubo was a college student in 1942 and this is her personal memoir of life in two of the internment camps. Okihiro, Gary Y. and Gordon, Linda, editors (2006) Dorothea Lange and the censored images of Japanese America Internment W.W. Norton, ISBN-13: 978-0393060737 The War Relocation Authority hired photographer, Dorothea Lange to document the evacuation and the internment from 1942 to 1945. She was given strict instructions not to show the guards, barbed wire, watch towers, and to photograph the evacuation and relocation but not in detail. This is a collection of photographs that were impounded and suppressed from publication by the federal government. Uchida, Yoshiko, Desert Exile: The Uprooting of a Japanese-American Family, (1984) University of Washington Press, ISBN: 0295961902. This story is a compelling autobiographical narrative of injustice, racial prejudice, endurance, and family devotion. After the attack on Pearl Harbor by Japan and the outbreak of World War II, the family endures the fate suffered by many other Japanese Americans: they are forced to abandon their home and are relocated to an internment camp in Utah. Yellin, Emily, Our Mothers' War: American Women at Home and at the Front During World War II (2005) Free Press Publisher, ISBN: 0743245164. This book reveals all of the responsibilities held by women, including helping to manufacture aircraft, ships, and other munitions; and, in the process, out producing all of America's allies and enemies, by far. Yamada, Mitsuye, Camp Notes and Other Writings (1998) Rutgers University Press, ISBN: 081352606x. Her reflections of the camp are vivid, pain-filled, weighted with irony. She confronts the 'invisibility' of Asian American women in American culture. Topaz, Ken Verdoia, director (1991), available at www.kued.com. Documents the denial of rights to American citizens of Japanese descent who were forced from their homes to Utah's desert rangeland during World War II. Asian American Curriculum Project (AACP) for over 33 years, AACP has featured extensive collection of Asian American books and educational materials. Get the online catalog at www.asianamericanbooks.com or call them at (800)874-2242 or (650)357-1088. They're located in San Mateo, California. California Civil Liberties Public Education Program at www.library.ca.gov/grants/cclpep/. The California Civil Liberties Public Education Program (CCLPEP) was created in 1999 as the result of the passage of the California Civil Liberties Public Education Act sponsored by Assembly member Mike Honda and others. The legislation creates the California Civil Liberties Public Education Program, (CCLPEP). 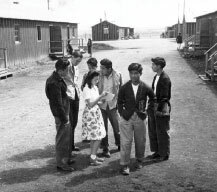 Its purpose is to provide competitive grants for public educational activities and the development of educational materials to ensure that the events surrounding the exclusion, forced removal and incarceration of civilians and permanent resident aliens of Japanese ancestry will be remembered and so that causes and circumstances of this and similar events may be illuminated and understood. Masumi Hayashi, a photography professor at Cleveland State University has visited and photographed most of the internment camps. See her collection and researched material at www.masumihayashi.com — includes information about Japanese Canadian internment. War Relocation Authority Photographs of Japanese American Evacuation and Resettlement at the Bancroft Library, UC Berkeley www.oac.cdlib.org. Type "Bancroft library WRA" in the search window and this will lead you to the online collection. 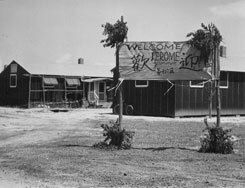 This is one of two large digital collections of War Relocation Authority photographs that are part of the National Archives. They have many of the same photographs though the National Archives collection is more comprehensive. The large majority of photos in both collections have been digitized and are available on-line. National Archives www.archives.gov/research/japanese-americans/ This on-line area is specific to the Japanese American experience during World War II. You'll find many links including those to a database listing the names of most of the internees (based on 1940's records), Nisei military records, and twenty days of Congressional testimony which eventually led to the Civil Liberties Act of 1988. The City of San Francisco has a virtual museum with Japanese American Material, go to www.sfmuseum.org and type "Japanese Internment" in the search engine.